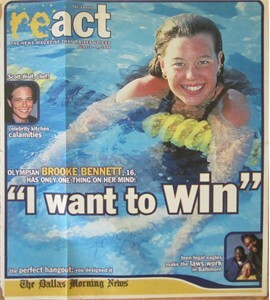 1996 React newsprint magazine COVER ONLY autographed in blue ballpoint by Olympic swimmer Brooke Bennett, who went on to win three individual freestyle swimming gold medals (one in 1996, two in 2000). 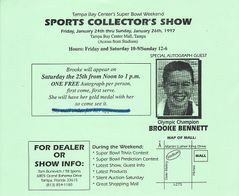 Obtained in person at 1997 appearance in Tampa, with flyer from the appearance and certificate of authenticity from AutographsForSale.com. NOTE: has vertical crease running down through the a in React. ONLY ONE AVAILABLE FOR SALE.